거돈사 옛 절터의 금당터 앞에 세워져 있는 탑으로, 2단의 기단(基壇)위로 3층의 탑신(塔身)을 올린 모습이다. 아래층 기단은 네 면의 모서리와 가운데에 기둥 모양을 새긴 형태로, 기단을 이루는 밑돌·가운데돌·맨윗돌이 각각 4매로 이루어진 특징이 보인다. 위층 기단은 남·북쪽에 무늬없는 긴 돌만 세우고 동·서면에는 가운데에 기둥 모양을 새긴 돌을 끼워 맞춘 방식이다. 즉, 남·북쪽에서 보았을 때 동·서면에 세운 석재의 두께가 자연스럽게 기둥 모양으로 보이도록 한 것이다. 탑신은 각 층의 몸돌과 지붕돌을 각각 하나의 돌로 구성하였다. 5단의 밑받침을 둔 지붕돌은 두꺼우면서 경사면의 네 모서리가 곡선을 이루고 있다. 처마는 직선을 이루는데 끝부분에서의 들림이 경쾌하여 통일신라 양식임을 알 수 있다. 탑의 꼭대기에는 머리장식을 받치는 네모난 받침돌만 남아 있고, 그 위에 놓여진 연꽃 모양의 보주(寶珠)는 최근에 얹어 놓은 것이다. 탑의 조성연대는 2단을 이루는 기단구조와 기둥 모양의 새김, 5단의 지붕돌 받침 등의 수법으로 보아 9세기 작품으로 추정된다. 절 터에 있는 민가 우물가에는 탑 옆에서 옮겨왔다는 배례석(拜禮石:탑 앞에 놓여 예불을 드릴 때 향을 피우던 곳)이 놓여 있다. 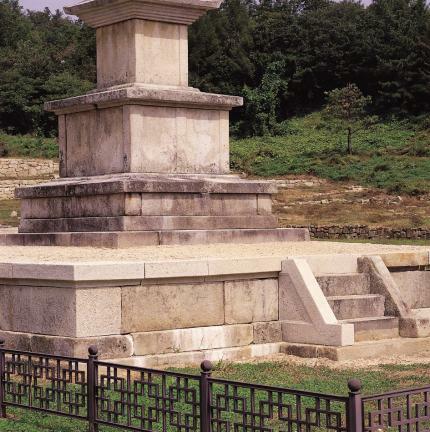 This pagoda, standing at the former site of Geodonsa Temple, consists of a three-story main body supported by a two-layer stylobate. The middle of each surface and the four corners of the bottom layer of the stylobate are engraved with pillar patterns. In particular, the stylobate is composed of bottom, middle, and top parts, each of which consists of four separate pieces of stone. 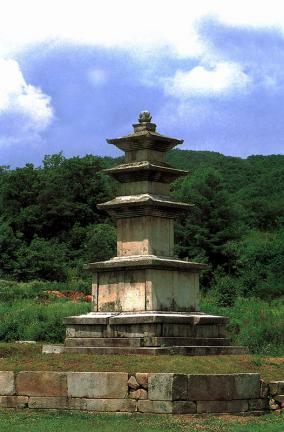 The top consists of unadorned long stones erected vertically, while pillar-shaped stones are inserted into its middle horizontally. In other words, the stones erected in the east and west of the top layer of the stylobate resemble pillars viewed from the southern and northern directions. 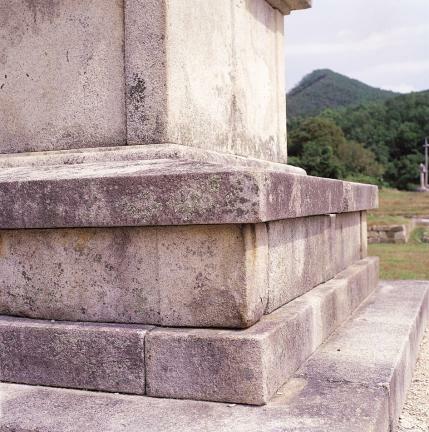 The core stone and the roof stone of the main body are each hewn from a single stone. 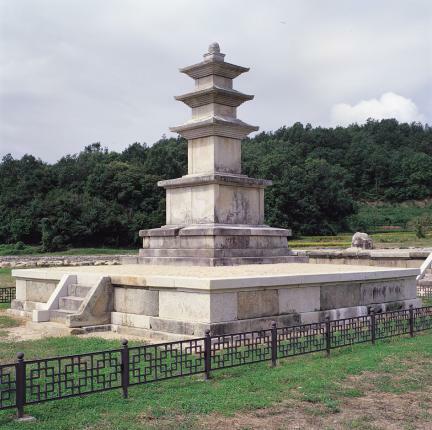 The thick roof stone is supported by a five-tiered cornice, and the four edges of its slate form a curve; while the eaves show the typical style of the Unified Silla period, i.e. straight before turning swiftly upward at the corners. 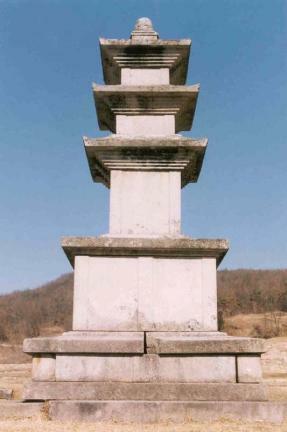 The only remaining part of the pagoda’s finial is the square base for decoration. The finial, which is decorated with a large lotus bud, has been attached recently. 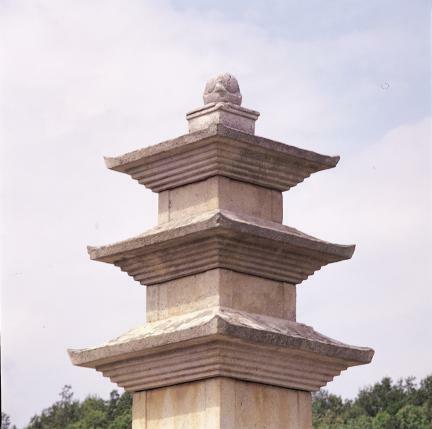 Judging from the two-layer stylobate’s structure, sculpted pillar pattern, and five-tiered cornice, the pagoda is thought to have been built during the 9th century. 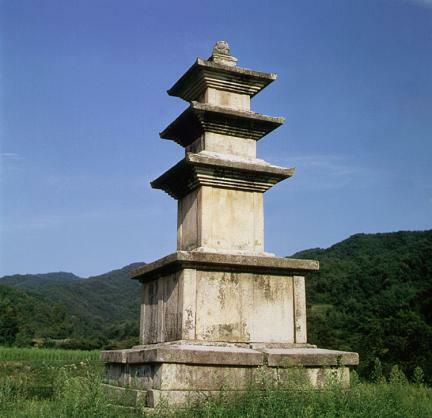 In addition, the prayer platform, which was designed to burn incense during worship, is said to have been relocated from near the pagoda to the well of the residential area at the temple site.